Like many Americans, I’d heard “100 Years” and “Superman,” but outside of those songs I’d never paid much attention to Five For Fighting. Then I read this interview with John Ondrasik, the man behind Five For Fighting, on Big Hollywood in early December. 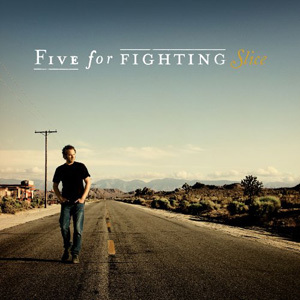 The interview inspired me to check out Slice, Five For Fighting’s most recent album, from my local library. It’s inevitable that every artist puts a part of himself into his work. After all, that’s what makes what each artist has to offer unique. Not surprisingly, often some of the more foundational beliefs of the artist make their way in, such as religious beliefs, political beliefs, etc. We have free speech though, so even when these beliefs are annoying, extreme, or just plain ridiculous, those making them do have a right to them. All too often though, I feel that people espousing more conservative or traditional views keep it to themselves. That’s why listening to Slice was so refreshing. The whole album is a pleasure to listen to and I recommend you check it out. “Note to the Unknown Soldier” is a lovely song written as “a letter of appreciation to all American soldiers, past, present, and future.” Those of you who saw The Blind Side may recognize “Chances” as the song that played during the credits. The song that got to me the most though, and which gave me goosebumps as I drove to work, is “Tuesday.” This song is about 9/11 and expresses the writer’s fear that people are forgetting the lessons learned on that Tuesday and returning back to Monday. And if that’s not enough to entice you to check out Five For Fighting, “Two Lights,” off of the album by the same name, was inspired by a chat John Ondrasik had with Victor Davis Hanson along with one of VDH’s former students. Anyone who gets inspired to write music after talking to VDH is ok in my book. Slice was well worth checking out from the library and deserves to be listened to beyond the three week checkout limit. So now I know what I am going to buy with the rest of the itunes gift card I received for Christmas.